Serez-vous capable de sortir de cette maison abandonnée et d’echapper à la menace qui vous guette ? 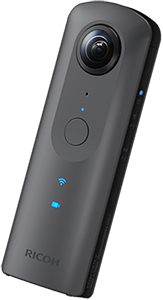 Vivez une effrayante experience 360° réalisée avec les cameras RICOH THETA V… Une récompense attend les plus courageux d’entre vous ! Ricoh Imaging Europe S.A.S. ("us", "we", or "our") operates the www.thetaescapegame.com website (hereinafter referred to as the "Service"). ServiceService is the www.thetaescapegame.com website operated by Ricoh Imaging Europe S.A.S. Ricoh Imaging Europe S.A.S. will also retain Usage Data for internal analysis purposes. Usage Data is generally retained for a shorter period of time, except when this data is used to strengthen the security or to improve the functionality of our Service, or we are legally obligated to retain this data for longer periods. Under certain circumstances, Ricoh Imaging Europe S.A.S. may be required to disclose your Personal Data if required to do so by law or in response to valid requests by public authorities (e.g. a court or a government agency). To protect and defend the rights or property of Ricoh Imaging Europe S.A.S. If you are a resident of the European Economic Area (EEA), you have certain data protection rights. Ricoh Imaging Europe S.A.S. aims to take reasonable steps to allow you to correct, amend, delete or limit the use of your Personal Data. The right to withdraw consent. You also have the right to withdraw your consent at any time where Ricoh Imaging Europe S.A.S. relied on your consent to process your personal information. These Terms and Conditions ("Terms", "Terms and Conditions") govern your relationship with www.thetaescapegame.com website (the "Service") operated by Ricoh Imaging Europe S.A.S. ("us", "we", or "our"). The Service and its original content, features and functionality are and will remain the exclusive property of Ricoh Imaging Europe S.A.S. and its licensors. The Service is protected by copyright, trademark, and other laws of both the France and foreign countries. Our trademarks and trade dress may not be used in connection with any product or service without the prior written consent of Ricoh Imaging Europe S.A.S..
Our Service may contain links to third-party web sites or services that are not owned or controlled by Ricoh Imaging Europe S.A.S..
Ricoh Imaging Europe S.A.S. has no control over, and assumes no responsibility for, the content, privacy policies, or practices of any third party web sites or services. You further acknowledge and agree that Ricoh Imaging Europe S.A.S. shall not be responsible or liable, directly or indirectly, for any damage or loss caused or alleged to be caused by or in connection with use of or reliance on any such content, goods or services available on or through any such web sites or services. Ricoh Imaging Europe S.A.S. assumes no responsibility for errors or omissions in the contents on the Service. In no event shall Ricoh Imaging Europe S.A.S. be liable for any special, direct, indirect, consequential, or incidental damages or any damages whatsoever, whether in an action of contract, negligence or other tort, arising out of or in connection with the use of the Service or the contents of the Service. Ricoh Imaging Europe S.A.S. reserves the right to make additions, deletions, or modification to the contents on the Service at any time without prior notice. Ricoh Imaging Europe S.A.S. does not warrant that the Service is free of viruses or other harmful components. www.thetaescapegame.com website may contain links to external websites that are not provided or maintained by or in any way affiliated with Ricoh Imaging Europe S.A.S. Please note that the Ricoh Imaging Europe S.A.S. does not guarantee the accuracy, relevance, timeliness, or completeness of any information on these external websites.